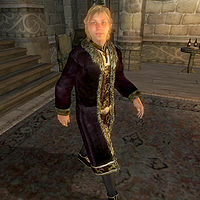 Primo Antonius, an Imperial noble, is a guest at Summitmist Manor in Skingrad. Like the other guests at the manor, he will be killed during the Dark Brotherhood quest Whodunit?. He says he is attracted to Dovesi Dran. He wears upper-class attire consisting of a black & burgundy outfit and a pair of gold trimmed shoes. He also carries some gold. Esta página foi modificada pela última vez à(s) 05h46min de 14 de maio de 2015.